HOME DEPOT, STAPLES, PETSMART, AC MOORE. The "Saratoga Mall" was originally called "The Pyramid Mall" it originally opened in 1974. It was never a large mall. It was a time when malls didn't have to me "mega" and super-sized. Before 1974 the only shopping in Saratoga was the downtown (which was still mostly boarded up and run-down back then, like many downtowns across the country) or the small plaza on the western edge of the city which had a Jamesway (a discount chain) and a P&C Supermarket. Otherwise you had to drive to Schenectady, Glens Falls, or down to Albany / Colonie area. In the 1970's the anchor stores were Barkers (a discount chain) and Montgomery Wards. The Mall had some very high-end stores for it's time when it opened. "The Carl Company" (or Carl's) was a local nice chain out of Schenectady. Who could forget "Denby's"? It was another local department store out of Troy, New York which specialized mostly in womens fashion. "Jonathan Reid" which was a mens store noted for it's service. "Argersingers" was a department store out of the Gloversville / Johnstown area which was famous for it's service. The mall went into some very hard times in the early 1980's. "Barkers" closed, and was replaced by "Kings" and then they closed. Stewarts moved out of the mall, and got out of the "sit down" ice cream parlour business. The sports store closed, and Denby's went out of business. I personally remember back in 1982, the whole north end of the mall was just about empty. The smaller stores left, even with a McDonalds in the mall (which opened up in late 1970-something), the mall was just about dead. By the mid 1980's the mall well on it's way back to health. The mall expanded from three movie theaters, to six. Chain "Service Merchandise" moved in, as did other shops and services. "Record Town" a capital-region chain music store held the market in Saratoga because no other record / tape stores were around (downtown didn't have "Strawberry's" yet). Other stores expanded, or moved to other areas in the mall. Newer hip stores like "Habitat" moved in as well as did Jamesway by the end of the decade. When the Pyramid Mall renovated and updated it furnishings and style somewhere around 1989 /1990 .....it was a little too late. The new Wilton Mall (right behind it) was the area's new darling (like Rotterdam Junction, the year before). The the ugly dated orange and brown mid-1970's decor was replaced, but the blue and white motif....er, just looked like a paint job with some ugly new furniture, and new awnings on the outside. Back when I was young this was the only mall we had in Saratoga Springs. It was called the Pyramid Mall. If we wanted to really shop, we either had to go up north to Aviation Mall or down to Crossgates, or even Clifton Country Mall. It was a relatively small mall which was shaped almost like a straight line. It originally housed a Jamesway on the north end, a Montgomery Ward on the south end, and a Service Merchandise and Carl Company in the middle. The smaller retail stores included a Carl Drug(later Fay's and then Eckard), a Papa Gino's pizzeria, a movie rental store! !, a very middle ages style Jonathan Reid, Jo Ann's Nut House, Payless Shoes, Record Town, Casual Corner, K-Bee Toys, Dime Savings Bank, Radio shack, and a few more. The mall did very well up until Fall of 1990 when the new, much larger and more modern mall called the Wilton Mall moved right next door. I heard rumors of connecting the two malls, but it never went into action. I always thought that that would have been a very good idea. When the new mall opened in 1990, the Pyramid Mall soon changed names to the Saratoga Mall, and underwent a very minor modernization. They got rid of the huge underground dome with seats, that sat in front of Carl Company. As soon as the Wilton Mall went into action, the old Saratoga/Pyramid Mall soon lost a lot of business due to stores moving over to the new mall. In early 1992, the Carl Company closed its doors, and remained vacant for about 4 years until the World Gym and JoAnn's Fabric shared the space. Next, the whole Jamesway chain died in 1995, which left the northern end of the mall without an anchor. The space was occupied by a flea market, which was open on weekends. Next in 1996, Montgomary Ward's closed leaving the southern end with no anchor as well. There was no replacement. Last of all was the Service Merchandise which closed in 1998. The loss of these stores left the mall anchorless, and gradually all of the remaining smaller stores closed as well. In 1999, they demolished the entire mall, and started building a large plaza, which consisted of Home Depot, a Target, a Barnes and Nobles, a Petsmart, an A.C. Moore, a Staples, and the Eckerd that was in the mall moved to a brand new store at the very front of the plaza. I guess when the new Wilton Mall opened, Saratoga Mall didn't really stand much of a chance. The original anchor store of this mall was not Jamesway - it was a chain called "Barker's". Sometime in the mid 80's Barker's became "King's", and went out of business a short time after. Around the same time as the close of King's, Jamesway's store on the other side of town in Saratoga burned down in a fire. So Jamesway conviently took the anchor spot in the mall. This mall never really died. It just became too valuable a piece of property for the property owner to hold onto. It started life as the Pyramid Mall of Saratoga. I belive it was opened in 1974, anchored by Jamesway, Montgomery Wards, and Service Merchandise. Jamesway met with failure in 1989, and closed the entire chain. At approximately the same time, the plans for the Wilton Mall (Wilmorite), a much larger mall, with more modern styling, were approved. The Wilton Mall was built in 1990, right NEXT STORE to the Saragota Mall. Montgomery Ward planned to build a store on the Wilton Mall, and Service Merchandice fell into bankruptcy and Pyramid braced for the worst. Service Merchandice closed in 1995, but Montgomery Ward inexplicably remained in the Saratoga Mall. Later on, it became evident the Saratoga Wards, like most Wards wasn't performing well enough to warrant a new store, leaving an empty piece of land at the Wilton Mall. That empty peice is still there, on the BJ's warehouse side of the mall, surrounded by a chain link fence. Inside the mall there is a corridor, that leads to a piece of sheetrock with a graphic on it. That wall used to say something to the effect of "future home of Montgomery Wards". When Wards closed the most of it's NY stores, the Saratoga Mall store was also axed. This essentially left Saratoga Mall anchorless, a Flea Market moved into the Jamesway space, and the two malls co-existed quite nicely. Until the Saratoga Mall's demolition, it remained largely occupied by non-traditonal mall stores. The last burnt orange and wood trimmed Radio Shack in operation was located in this mall. I've only encountered 2 others operating in all of my years (Camillus Mall, Camillus NY, and Some dead mall in Maine, I went to when I was 12 years old). So by definition, the Saratoga Mall never died. It was properly maintained, and always had a full parkinglot. Many non-chain stores occupied the mall, such as christian bookstores, 2nd hand clothing stores, a gym, the post office, etc. Rumor has it, that the Saratoga Mall remained MORE profitable than the Wilton Mall until it's demolition, due to low overhead. The saratoga mall was demolished in 1999 to make way for a VERY successful big box center. 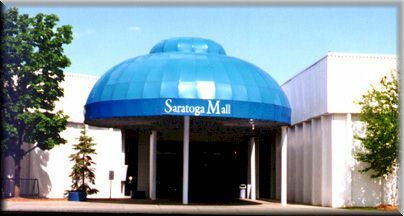 Oddly enough, it's website is still up, www.saratoga-mall.com. Check it out before it's gone.